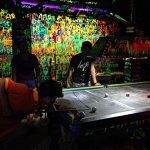 It’s hard to tell what was my best day trip in Thailand, there are so many cool places I visited and walking through the rainforest is just different than exploring remote and quite beaches. But the one trip I have done from Ko Pha Ngan is definitely one of the most memorable ones I have done here in Thailand. During my most recent island-hopping trip I didn’t even know about this archipelago of 42 islands called Ang Thong National Park (อ่างทอง), set about 35 km west of Koh Samui and Koh Pha Ngan in the Gulf of Thailand. 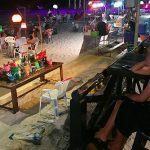 I had just taken the morning ferry from Koh Tao to Koh Pha Ngan and started walking around Haad Rin, the name of the beach where the famous full-moon parties are going on every month. So I passed travel agents that all seemed to promote this trip to the archipelago I had never heard of before but then I saw the pictures, these beautiful islands, limestone cliffs with mangrove forest and crystal clear water, the whole area once a hide out for pirates. I immediately knew that I wanted to see this place with my own eyes. Pick up in the morning by pick-up taxi (songthaew) at 7am. I bargained the price down to 3,400 Baht at one of the agents, paid in cash and the next morning with just ten minutes delay they picked me up by the said pick-up taxi, or how Thais call it: songthaew. 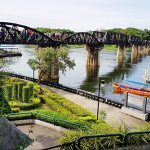 It was a short, bumpy and quick ride up and down the island’s hills to Pha Ngan’s west coast where the harbor is located, as well as the office of most of the tour operators. We had some basic breakfast there: instant coffee, white bread, cheap jam, some biscuits – just an ordinary Western style breakfast in Thailand but I didn’t pay for good food after all. A group of 12 people including me hopped on the boat at 9pm and our Thai captain drove out of the harbor towards the Ang Thong archipelago (there was an English speaking Thai tour guide as well). I first thought to be lucky to have a seat in front but after ten minutes I had to give up and sit more in the back since the waves made the ride extremely bumpy and it seemed just the Indian guys enjoyed it there without having the feeling to throw up sooner or later. It took almost two hours to reach Ang Thong archipelago, the views as we came towards the dramatically arising islands and limestone cliffs were stunning and beautiful. We had our first stop for snorkeling just off one of the smaller islands. All gear was provided so all we had to do was put on maks, snorkel and flippers and jump into the crystal blue water. I spotted lots of colorful fishes, decent-sized reefs and followed my group members swimming to the beach of the small island. There was just one other speed boat like ours around so everything was in a fairly relaxed and quiet atmosphere. Just as we entered the boat again and began to continue our cruise the big boat from Samui was about to arrive, packed with estimated 200 mostly Asian tourists that were going to snorkeling there as well. The second part of the trip was visiting Koh Mae Ko, we went up a trail to the lookout over the gorgeous salt water Emerald Lake. The whole thing took about one hour return, and for the first time we met a lot of other boats and travelers. After that we continued our cruise to Koh Wua Ta Lap, the second biggest island of the archipelago and the highlight of the trip. We had lunch there (Thai food buffet, pretty good) and then we were given 2 hours free time by our tour guide. We basically had three options: Relaxing and swimming at the beach, hiking to a cave (about 30 mins return) or hiking to the view point (about 1 hour return). I decided to do the hike to the view point. The ascent was fairly steep and quite exhausting given the high temperature and humidity. I did a few breaks and at one point spotted this funny looking monkey. Even though the hike was kind of exhausting, it didn’t take me more than 45 minutes to reach the view point. The views from there over the archipelago were more than spectacular, with a similar wow-effect to when I first entered my favorite sky bar in Bangkok. 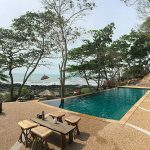 I would have loved to stay there for hours but since we had arranged a meeting time for returning to Ko Pha Ngan, after twenty minutes or so I started with the descent. I didn’t have enough time to hike to the cave but at least I could take a refreshing dip back down on the beach before entering the boat and cruising back to Koh Pha Ngan just before sunset. Note that there are only speed boats going on this trip from Koh Pha Ngan. You can save a lot of money by going on a big boat from Koh Samui (about 1,800 Baht, depending on the season), but then you have a lot more people not just in the boat, but also in the water while snorkeling and hiking up the mountain on the big island. Tours can easily booked on the spot with one of the many travel agents or in most hotels on Pha Ngan and Samui. Also note that since 2015 there is a national park entrance fee of 300 Baht for foreigners (150 Baht for children). I think the price is alright given that they take you around the whole day with a super cool and new speed boat to this fairly remote archipelago. As I said, of course you can save some cash by going with the big boat from Samui, but then share it with a lot more people.